If you love the ambiance of a fireplace but are worried about your child or pet’s safety, electric fireplaces are a much safer alternative to traditional wood-burning or gas options. They are a great source of supplementary heat that is easy to install, inexpensive and easy to use. Since no actual flame appears, most electric fireplaces are cool to the touch, so you don’t have to worry about burns. If you have ever been around a toddler that likes to touch everything, you will understand how important this feature is when it comes to fireplaces. There are many different styles and types of electric fireplaces, so we have created a list of different styles that have all of the safety features that you will need for kids and pets. The Touchstone Onyx 80001 is an extremely popular wall mounted option. Its modern, decorative design and realistic adjustable flame are some of the key features to its success. It also has the no heat option so that you can use this fireplace year round. Wall mounted styles are great styles for almost anyone since they don’t take up much floor space and you can put them anywhere in your home. The Touchstone Onyx comes with a remote control to adjust flame brightness and temperature settings, and the unit can heat any room of up to 400 feet. The glass stays cool to the touch, and the heated air blows out the top. Since it is wall mounted it will be out of reach for most toddlers and pets. You may choose to hang it a little higher on the wall to make sure the top, where the air comes out, can’t be accessed until your child is old enough to understand not to touch it. Also since it is wall mounted, there is no chance of it tipping over (as long as it is secure on the wall). Duraflame has a number of different models that are great for kids and pets, with the DFI-5010-01 being one of their most popular models. It has all of the safety features that you will need when around kids and pets, including the cool to touch element. This model is known for its remarkably realistic flame and the high quality of the overall build. 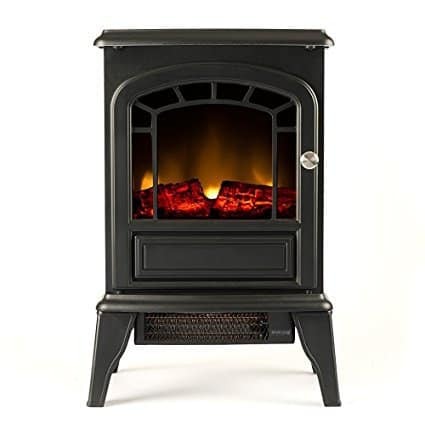 It looks like a metal cast iron stove, but it is pretty lightweight and easy to move around. This fireplace uses infrared heat, so it will heat the objects in the room and not just the air, so you don’t get the pockets of heat that you may find with other heaters. The SEI Cartwright is one of the more substantial designs that is a good option for kids and pets. It can heat up to 400 square feet and looks like a traditional fireplace; it even has a brick style interior. It is pretty heavy at 118.5 pounds, so you probably won’t be moving this one around much. Although this fireplace looks somewhat elaborate, you only have to do a small amount of assembly to get it going. It can support up to 85 pounds on the mantel. If you want a smaller option that gives the effect of a log burning fireplace, you could try this one from Duraflame. It is a 4,600 BTU heater that provides supplemental zone heating for up to 400 square feet. Even though it looks like the top of the unit might get hot, it doesn’t get warm enough to cause any problem if a child or a pet were to touch it. The hot air comes out of the grill that is underneath, and that can get a little bit hot. This style is minimal and versatile; you can use it in a small space or it into an existing fireplace. It has the optional heat feature and is light and easy to move around if needed. The Walker Edison is a beautiful, corner unit that is great for families that have a lot of digital components that need storage. You can definitely use this as a TV stand (for TV’s up to 50 “). 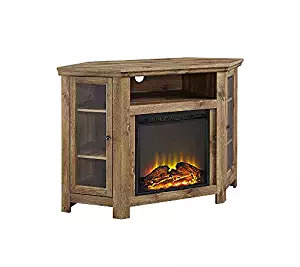 It comes with the fireplace insert as well as other shelving and storage. The only downside to this style is that it takes a while to put together all of the pieces. This rustic looking fireplace from Aspen is sturdy and quite lightweight, so you can move it from room to room if needed. It has all the standard safety features that you will need in a heater, including being cool to touch and having an auto shutoff feature if it is knocked over. It doesn’t come with a remote, but it does have a low or high heat setting. It’s a beautiful small fireplace that will work well for all flooring types. 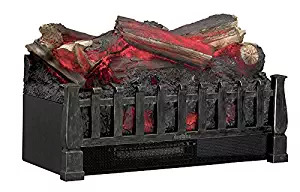 Dimplex has some different models that will work well for kids and pets. 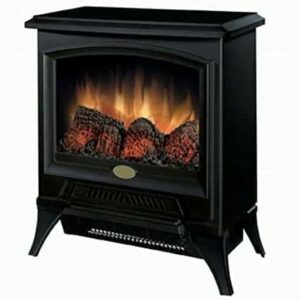 The CS12056A is a reasonably compact, traditional electric stove style of heater. This model can heat a room to around 400 sq. Ft. and it has the cool to touch feature. It is pretty small at only 17.5 inches wide, 21.75 inches tall and 12-inch deep stove. You can operate the flame with or without heat, so you can use it year round if you feel like it. If you are running it with the heat, it should only cost around 9 cents an hour (or 1 cent with no heat) depending on your electricity rate. Thankfully there is no assembly required, you can plug it in, and you are good to go. There are lots of cute, mini fireplaces that are great for small spaces like a child’s room. They aren’t all that different from small portable heaters; they just have the flames effect of creating a warming feeling in an area. This mini heater from Comfort Zone is very popular with people who are just looking to heat small spaces, it can only heat up to about 200 square feet or less. It is suitable for kids and pets because it is cool to touch and also has an automatic turn-off feature if you knock it over or if it gets too hot. 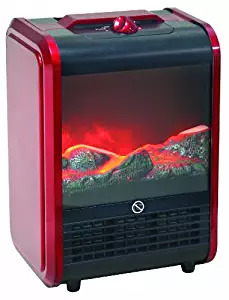 Since it is fairly small and inexpensive, you don’t get a lot of features with it, but it does have two heat settings and a fan only setting if you want to run it without the heat. Electric fireplaces look like traditional fireplaces, but they work by drawing cool air into the unit, heating the air (usually with a heated electric coil), and then the heated air is released into the room by a fan. There are also fireplaces that use infrared heat that heats the objects in the room evenly using infrared waves. The flames work by using different types of lights (usually LED), rotating silver refractors along with three-dimensional patterns to create the flame effect. If you are reading this post, your primary concern is most likely finding a heater that will be safe for your kids or your pets. Most electric fireplaces are kid and pet safe because no actual fire is produced, so the unit should not get very hot to the touch. Some units do get a little bit hot in areas that may be accessible to children or pets; it depends a lot on where the hot air is output. Cool touch- Most electric fireplaces stay cool to the touch on any glass that is present or on the entire unit overall since there is not real fire heating things up. The one thing you should watch out for is where the heat is being blown out from; sometimes it is on the bottom, top or the back. When choosing a brand or a style, you may want to think about where the hot air comes out and whether that may be within reach of your child or pet, since it may become warm to the touch. A child getting a burn from a unit would be extremely unusual, but not out of the question, if safety precautions aren’t being followed. Automatic shut off– An essential safety feature you should always have on heaters in use around children and pets is an automatic shut-off. This usually means that the appliance will shut if it gets knocked over or it overheats. You can also get models that have a timer that allows you to set it so that it will shut off when the timer is up after the selected time. Automatic shut-off helps reduce the risk of fires that can occur if appliances get overheated. That it is installed away from carpet, drapes, or any flammable material. That whatever style you get is securely mounted. In particular, mall mounted, or console styles should be anchored to a wall to prevent them from tipping forward since this can be extremely dangerous to toddlers. There is no shortage of design options for electric fireplaces. There are so many different styles available that you shouldn’t have any trouble finding something that suits your design aesthetic whether it is modern, contemporary or traditional. You can get products built into a decorative mantel or a media center; you can also get inserts that fit into existing fireplaces, wall mounts, corner units or mini units for small spaces. Flame-One thing to look out for when you are choosing a style is the quality of the flame or how realistic it looks. The flame types do tend to vary quite a bit and is one design issue you might overlook but is quite essential to consumers overall satisfaction with the product. Adjustable Heat Settings-To ensure that you are able to get the level of heat that you desire, make sure you get a model that has an adjustable heat setting, most will have at least a high or low setting. Remote Control– A remote control can be a handy feature that allows you to adjust the settings on your electric fireplace without having to get up while you are relaxing. Built-In Thermostat– A built-in thermostat allows the user to get a more precise temperature reading when changing the heat settings on the fireplace. BTU rating– If you want to heat a 400 square foot room quickly, you will probably want to look for a heater with at least a 4,000 BTU. If the room is much smaller, you can probably get away with a lower BTU. Optional heating – Most electric fireplaces can operate with or without heating, letting you enjoy the ambiance of your heating flame in the summer without producing any heat. 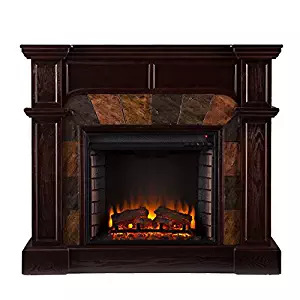 Electric fireplace won’t cause fires in the same way that a traditional fireplace might since there is no actual fire. However, like any appliance, they can become fire hazards if not properly maintained and used. Despite being much safer than traditional fireplaces, there are still some risks to using any electrical appliances, especially if you don’t read and follow all of the safety information that comes with the fireplace. There are some basic safety rules to follow like don’t use an extension cord, keep them away from curtains and make sure they do not become overheated. Electric fireplaces and space heaters are pretty similar. Although there are a vast variety of different styles of portable heaters and electric fireplaces, so it’s hard to make sweeping generalizations about both types. However, both are intended for use as supplemental heat sources and not a primary heat source. Both types use the same kind of heat sources (electric coils or infrared). The obvious difference is the flame effects on the fireplaces, which many people love and which can add a lot to the decor of a room. 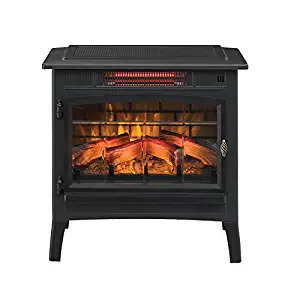 The addition of the flame feature, generally means you are probably going to pay a bit more for the fireplace than a space heater that would heat an equivalent size space. The cost for these types of devices can range from around $50 to well over $500. The cost will depend on the size ( you can get a mini heater in the $50 range that may only heat a 200 square ft. room). Generally the bigger they get, the more you are going to pay. Also, the more elaborate designs (large surrounding mantel with stone, etc.) are also features that will drive up the price. Heat output, quality of the product, flame options and features like a remote or a thermostat will also be factors in the price. The cost to run an electric fireplace is considered fairly inexpensive and depending on how you use them, you may be able to save as much as 10% on your overall heating bill. Size- Depending on where you’re going to install your unit, you’ll need to consider the size. Take measurements to ensure the product you purchase is the right size for your home. Installation- For the most part, installing these fireplaces couldn’t be easier. If you are planning on getting a media console you may have to do a bit of assembly, but, generally, they come fully assembled with all of the parts that you need and you just plug them in. Warranty– It is important to check and understand your warranty before you buy. Many are covered by a one-year warranty. Electric fireplaces are a great way to keep your child or pet comfortable and safe. Unlike regular fireplaces, they can stay cool to the touch, while at the same time effectively heating a room. They can change the look of a room with very little effort and cost. Most designs are also very portable, so you can take them with you if you move or if you just want to move the fireplace to a different room.